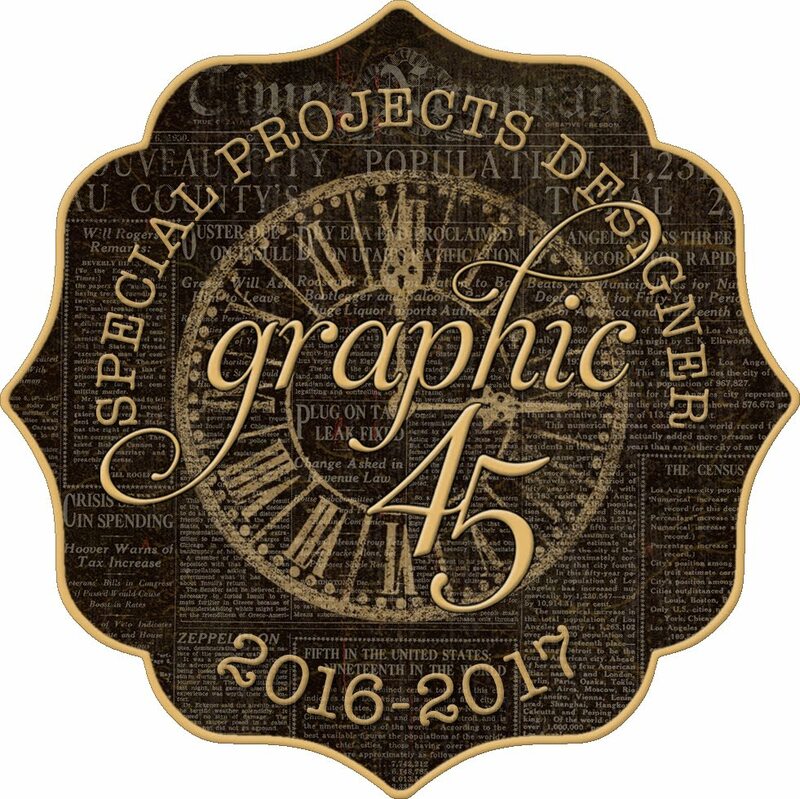 It's another great day over on the Graphic 45 blog today. 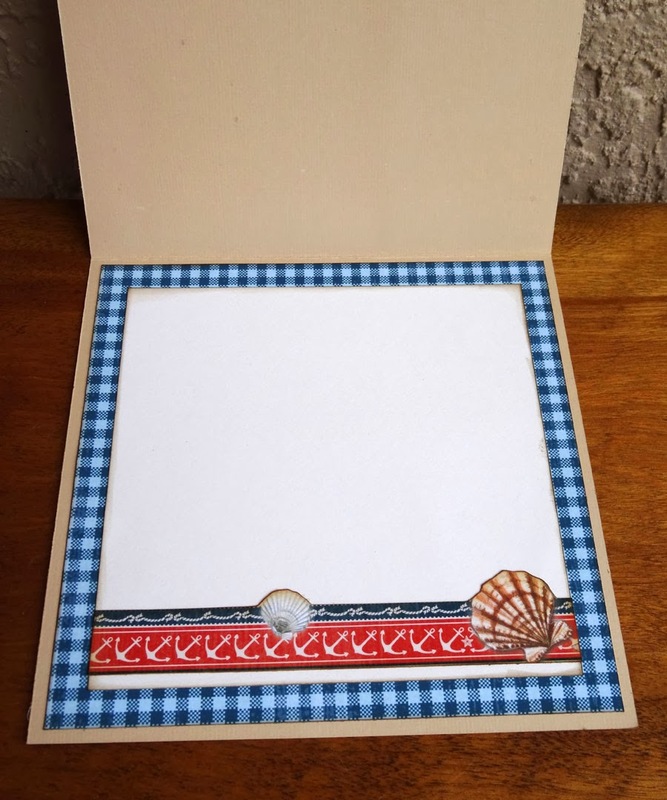 I'm sharing my Mother Goose baby mini album and fellow design team member Clare Charvill has a wonderful Mother Goose project as well. So be sure to head over there and check it out. I've got a video tutorial on mine, so don't miss that. View all the pages on the Graphic 45 blog here. I taught this album to two different classes the past two months. Here is the first bunch of happy crafters. And, of course, I failed to snap a photo of the second group. My apologies, ladies. Thanks for stopping in today. Hope your day is great! Good Monday morning. Here's a great day! Today I'm featured over on the Graphic 45 blog alongside fellow design teamers Romy Veul and Arlene Cuevas as we share our simple yet impressive card making ideas with three different paper collections. You're sure to be inspired. 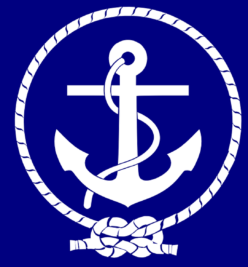 When you visit there, be sure to leave a comment because they have a retro give-away this time. (I wish I could win that one!) You'll see what I mean when you get there. 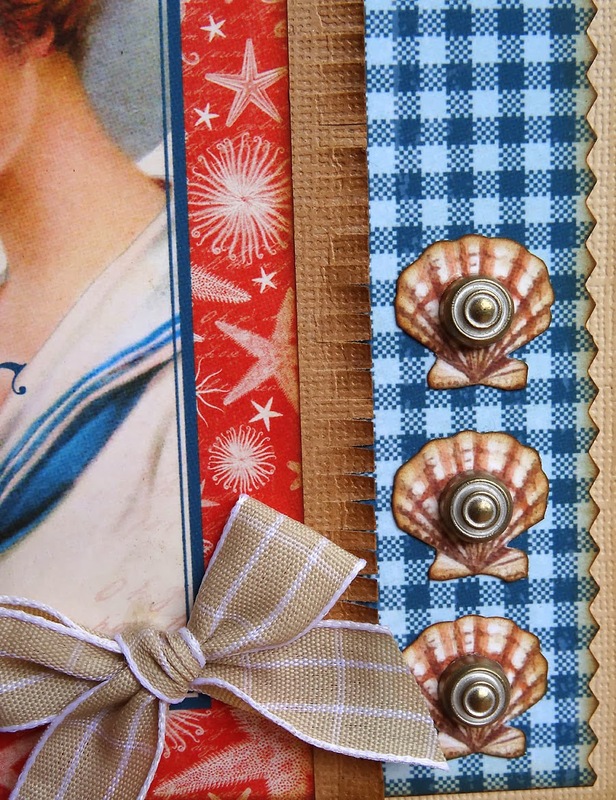 My card used the new By The Sea papers and Shabby Chic metal brads. Martha Stewart fringe scissors made easy work of this kraft paper edge. There are the Shabby Chic ornate metal brads I was talking about. And we can't forget the inside of the card. Did you notice there is NO stamping on this card? Just goes to show that with all those great images in Graphic 45's paper collections, you don't need stamps. I simply cut apart the images and inked the edges before sticking them down. How much easier can it get? Thanks for taking the time to pop in today. 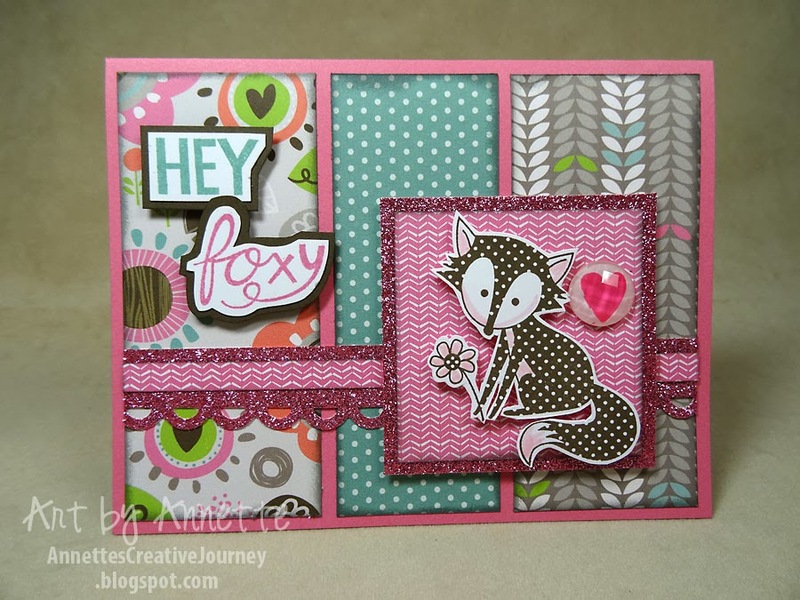 Don't forget to go over to the Graphic 45 blog to see the other gals' creations and leave a comment to be entered to win that awesome prize pack. Have a great day! Whew, sometimes YouTube and I just don't get along. Not sure why, but I had such a time trying to get this simple, short video to upload last night. Finally this morning after another try, it cooperated! 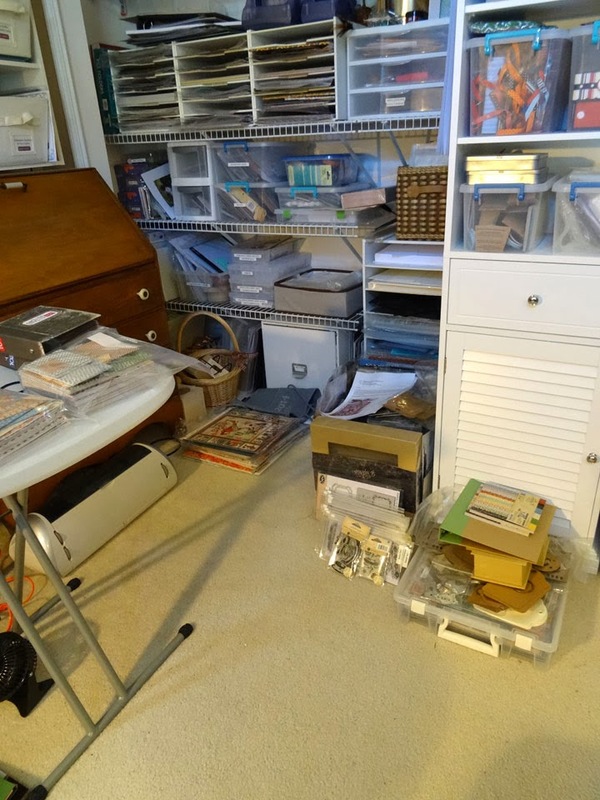 Take another tour of my craft room, this time a little more close-up. 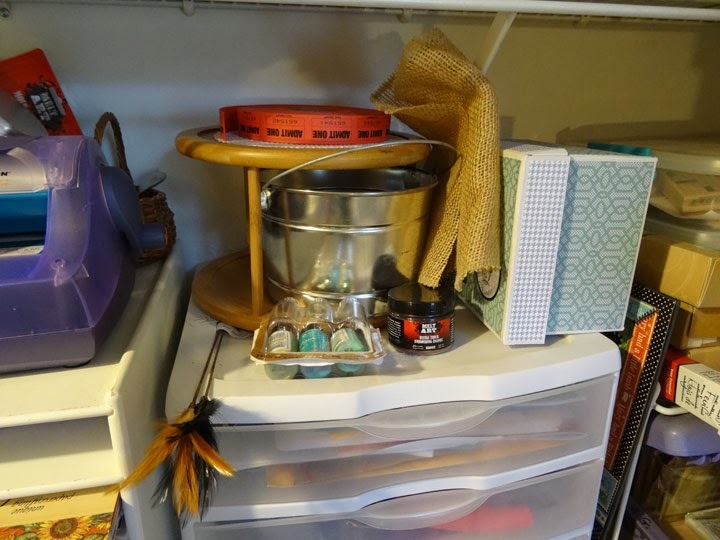 Here I share some tips on storing your craft supplies to help you feel in control of your space and not overwhelmed while trying to create. Please keep in mind that I'm not here to teach you how to "hoard" stuff and I try not to focus on the "ownership" of stuff. 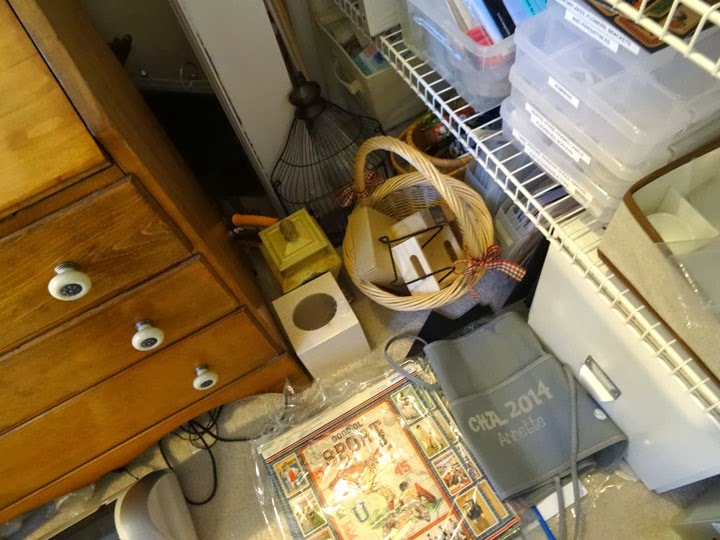 It's not a video that says "looky at all the stuff I have!" 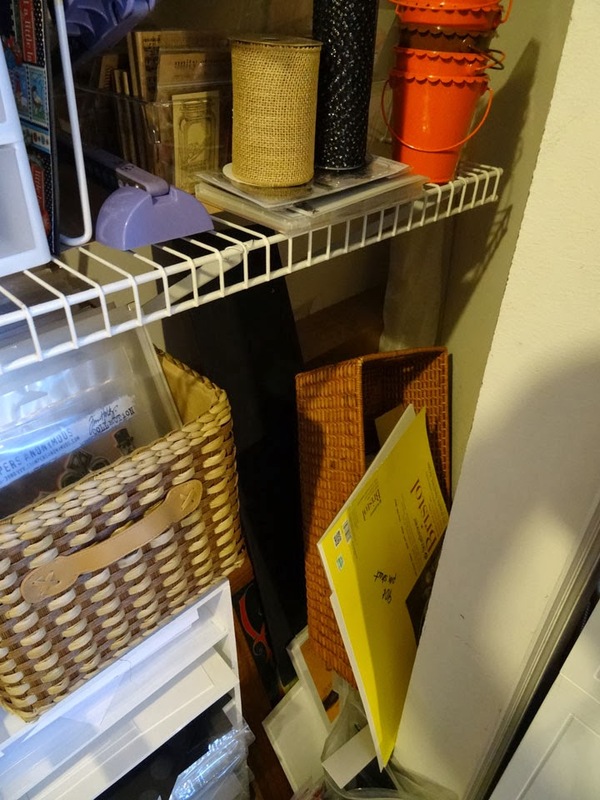 My goal is to share ways to keep the things you use in the best organized way possible for efficient crafting. And since crafting is my full-time job, I need things to be orderly and as efficient as possible. I don't hoard anything, by the way. I only buy what I'll use (not just because it's on sale or a "deal") and I definitely use what I buy. If I haven't used something in a year, out it goes. Two times a year I hold a clearance sale in my home and what doesn't sell goes to the local elementary school, the Girl Scouts or my local church thrift shop. 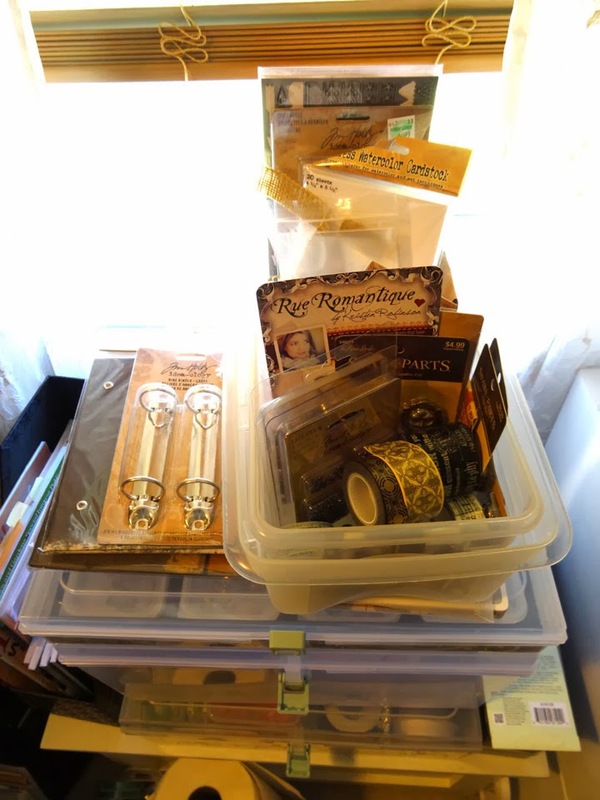 I have no problem letting go of supplies that I have outgrown, and I feel especially good if someone else can enjoy them. So check it out and let me know your thoughts. I apologize in advance for the fast camera movements in certain scenes. (I really need a camera person so I can be hands-free.) Part 3, the final video, will be coming next week or so, so be sure to check back or subscribe to my YouTube channel. Thanks for looking, and have a great weekend! Hello and happy Wednesday. It's already a gorgeous day here in central Florida, but I know that many of you are suffering in the snow and winter weather so I won't go on and on about it. Let's just say THIS is why people move to Florida eventually. Today I'll put some Springy sunshine into your day by sharing my Botanical Tea layout I created for the Graphic 45 booth at Winter CHA. Here's just a sneak peek above, but you can see the full layout and more detailed photos over on the Graphic 45 blog today at this link. While you're there, check out the quick video by Charee and then a gorgeous mini album by Alberto. Be sure to leave a comment over there so we know how you liked the projects. By the way, that's our daughter Jamie in the photos. She makes these beautiful flower crowns for herself and her friends. I just thought these pictures were a perfect fit with the lovely Botanical Tea. Okay gang. 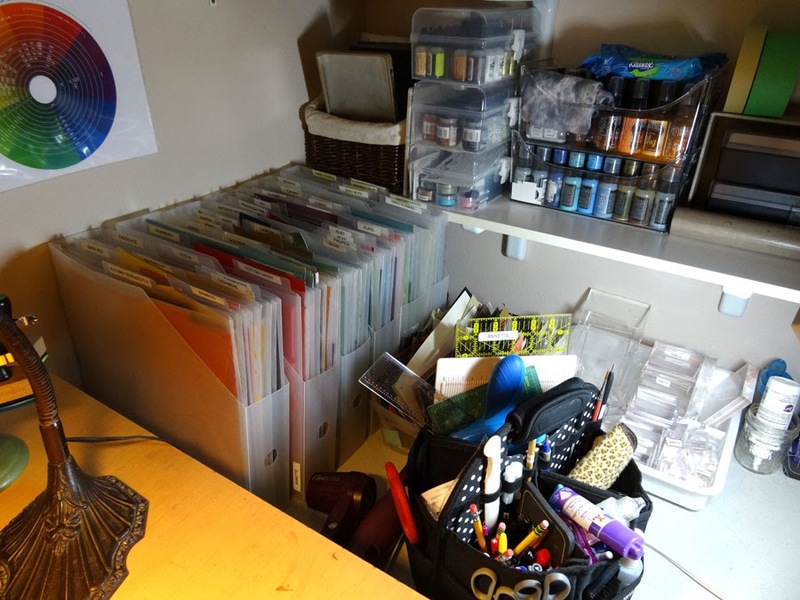 Here's the first of three videos sharing my craft room and how I organize it. 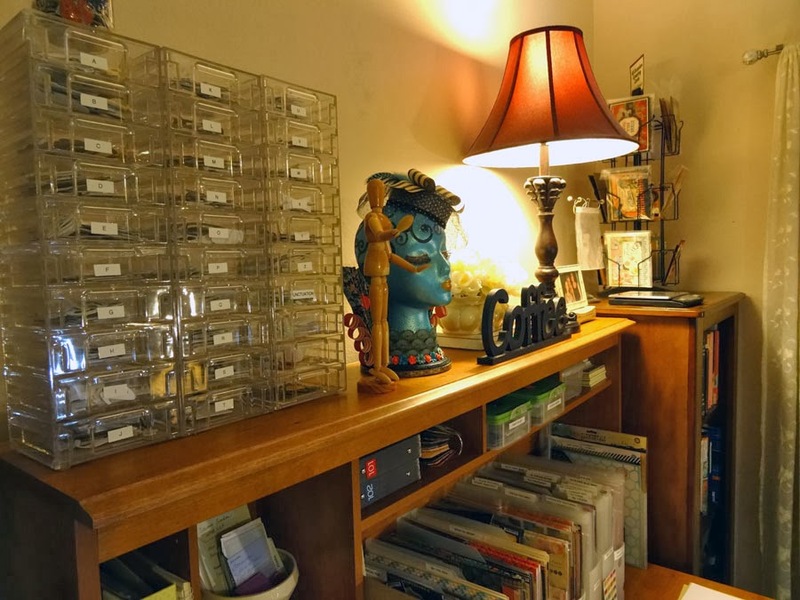 Part 1 video is a quick tour of my room and a basic overview of how I store things. Part 2 will go more into depth of the organization you see in this one. Then Part 3 I'll share some affordable tips and tricks that may inspire you. Oh, and by the way, Happy Valentine's Day! Hello on this fine Tuesday. 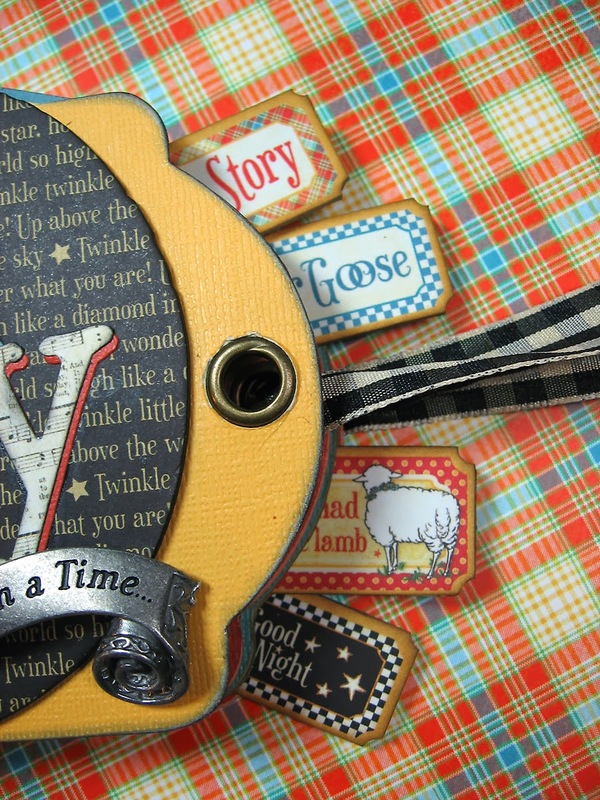 I've got samples to share with you today from my Close To My Heart Spring/Summer 2014 Idea Book Trunk Show. As I mentioned yesterday, I pulled these little samples from a vintage suitcase and passed them around my show to the guests to see up close in person. Let's get right to it then. The Stamp of the Month is available only for its month, and you can get it for just $5 with your qualifying order of at least $50 or more. Or you can purchase the set at full retail of $17.95. 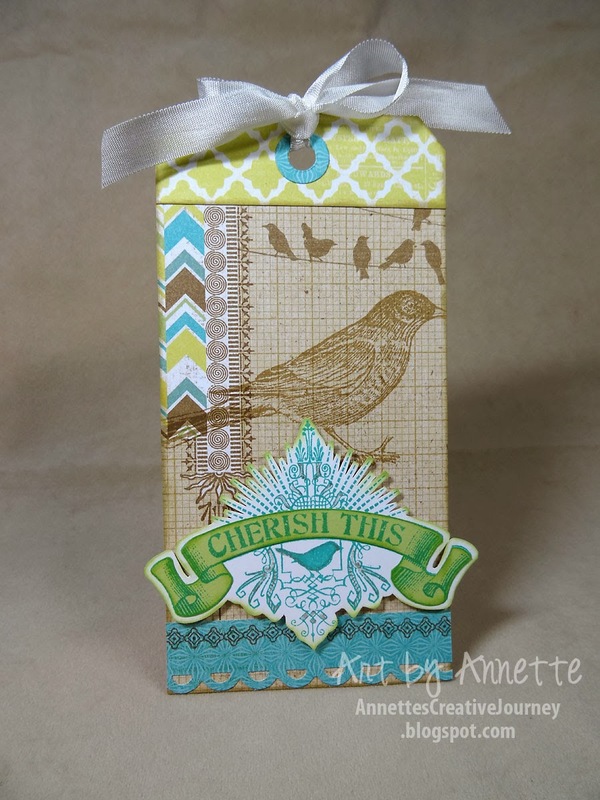 Next is the beautiful "Skylark" paper pack on this tag I created using the "Believe in Yourself" stamp set. One of my favorites this season. Skylark is also my February Kit of the Month, which includes the Skylark chipboard complements and the teal flowers from the Skylark Assortment. My kit of the month includes four pages (two 2-page spreads as you see here), cutting directions, photos, and assembly tips. Each kit is $20 plus shipping. 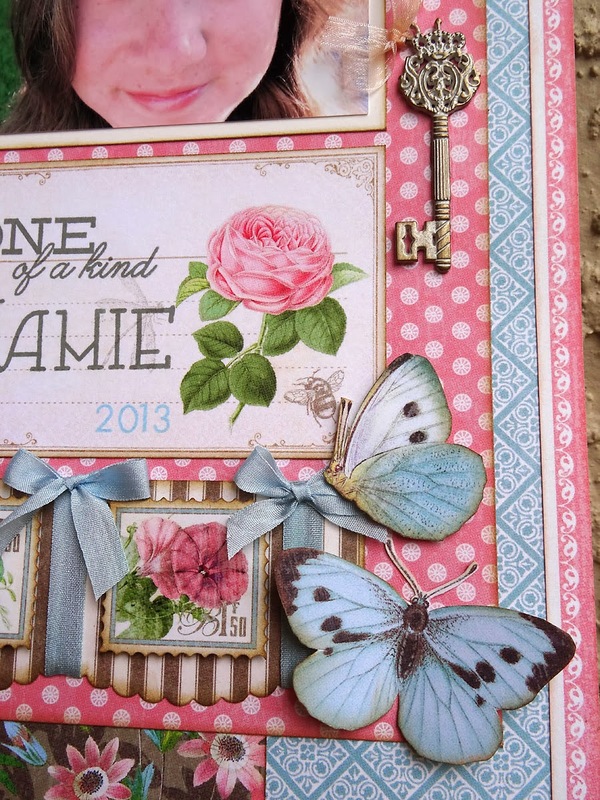 The new "Ivy Lane" paper pack has lovely color combinations of pinks and plums and greens. 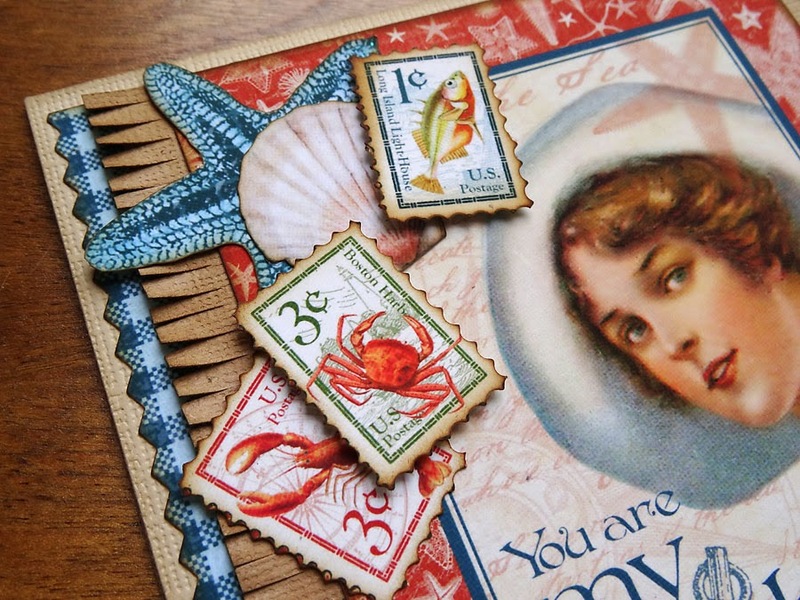 The stamp set featured on this card is called "Dreamer." I've used the Ivy Lane Assortment to embellish. 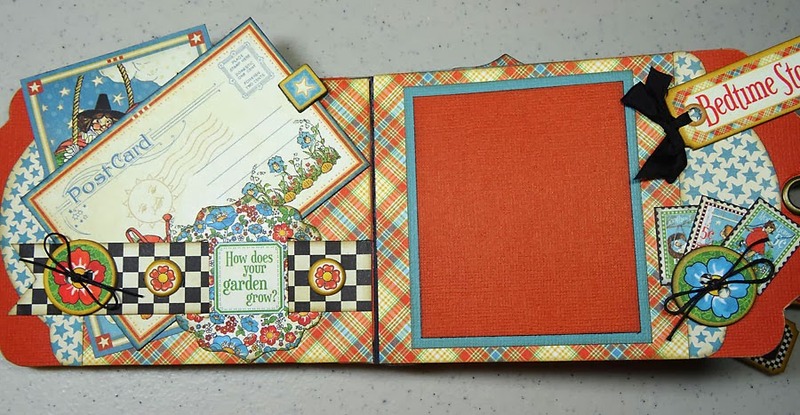 This simple card using Ivy Lane was the make-n-take at my trunk show. 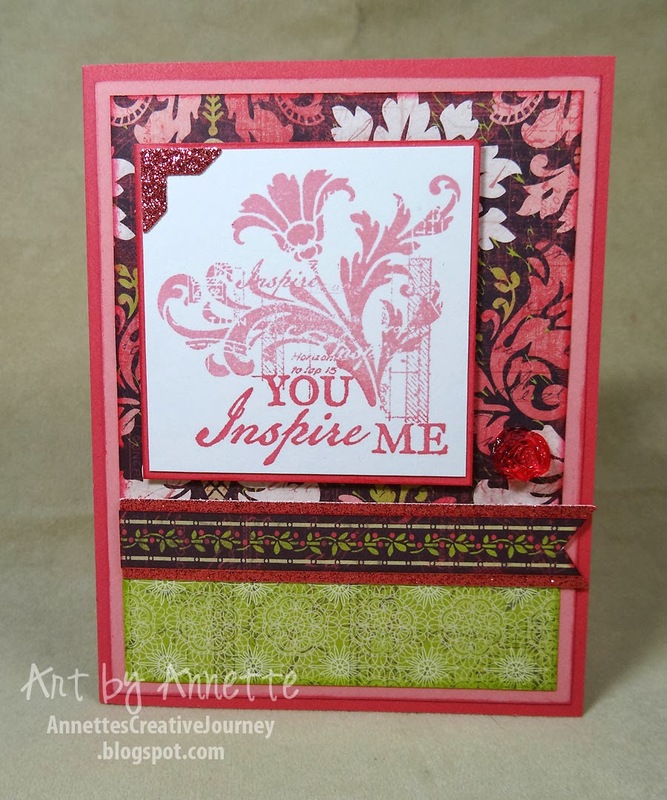 It features two-toned stamping using the "Inspiration Flourishes" stamp set, glitter paper, and one of the pink flowers from the Ivy Lane Assortment. 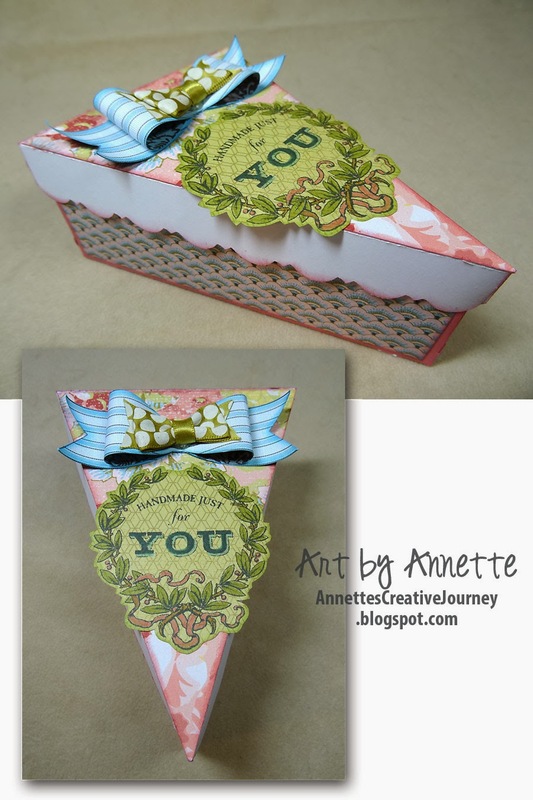 "Ariana" is the name of this pretty paper collection on this cute pie box using the Artiste Cricut Cartridge. I've covered up so much of the paper, unfortunately, so be sure to check the link at the bottom of this post to see all the papers in this collection. 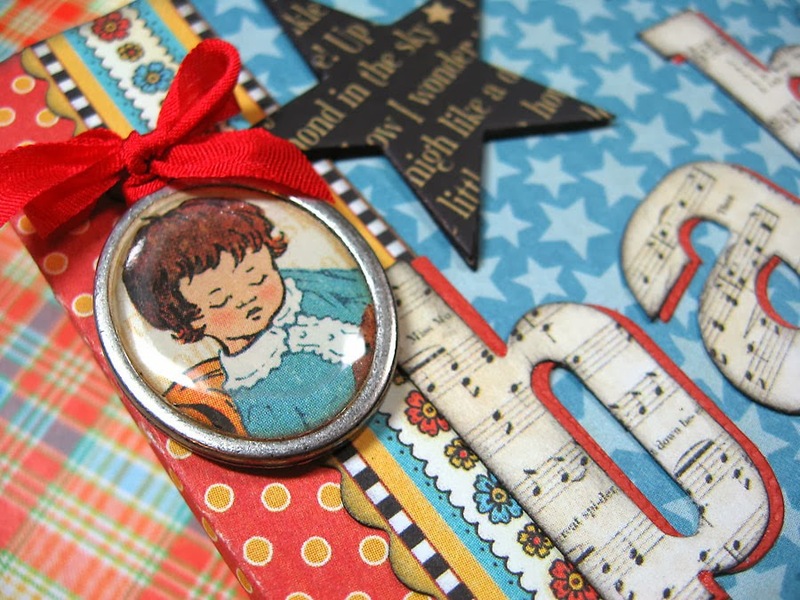 I've included one of the sweet little fabric bows from the Ariana Assortment, and used the "For a Friend" stamp set. 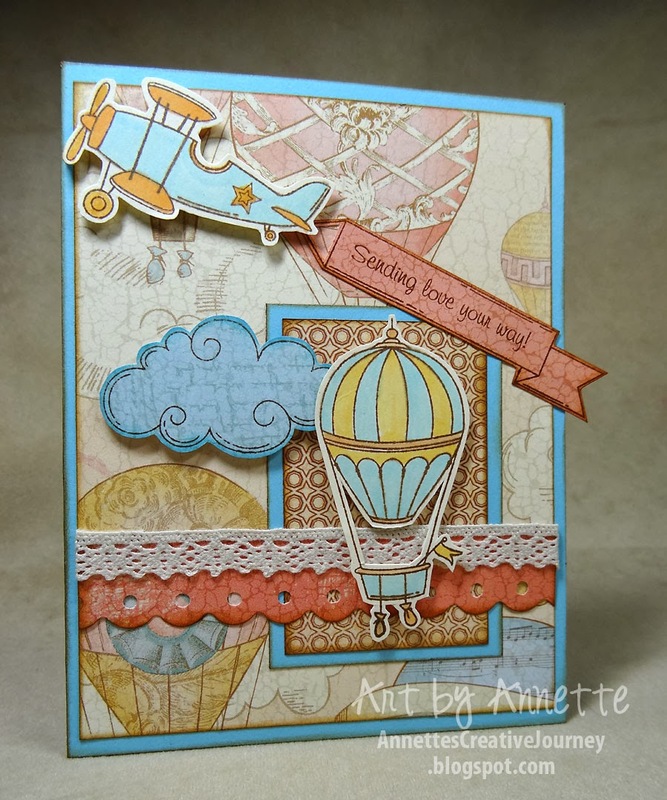 Appropriately named, this paper pack is called "Balloon Ride" and features pastel shades and whimsical hot-air balloons. I used the "Lifting Spirits" stamp set with Saddle ink for stamping, then colored in with alcohol markers. Foam tape really adds great dimension to images on this card. 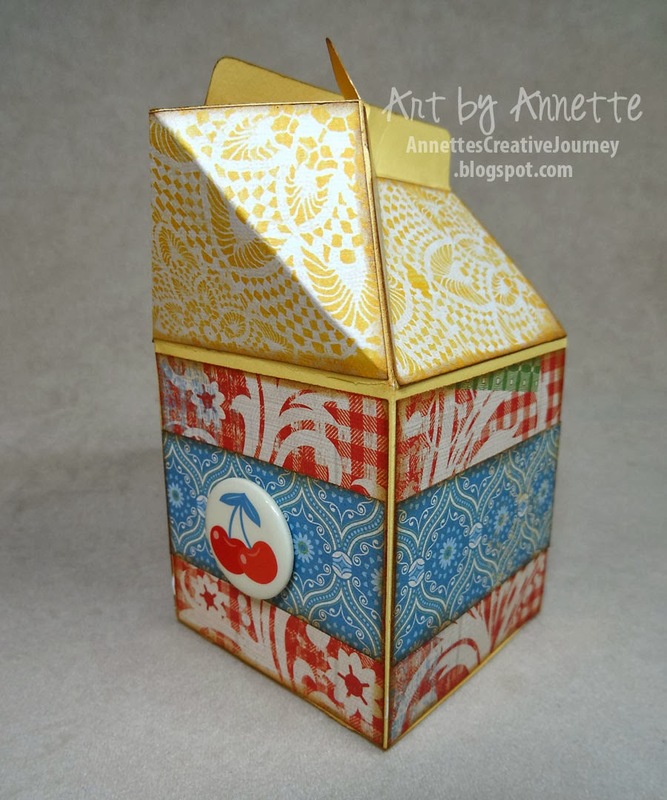 Next up in the "Jubilee" paper pack on this simply and fun milk carton treat favor box, also cut from the Artiste Cricut cartridge. This paper collection is perfect for summer, barbecues, family reunions, picnics, and more. I've added one of the adhesive badge buttons on the front from the Jubilee Assortment. Be sure to click on the link below to get a better look at all the papers in this pack. And finally is "Timberline." A nice, masculine outdoorsy paper pack. 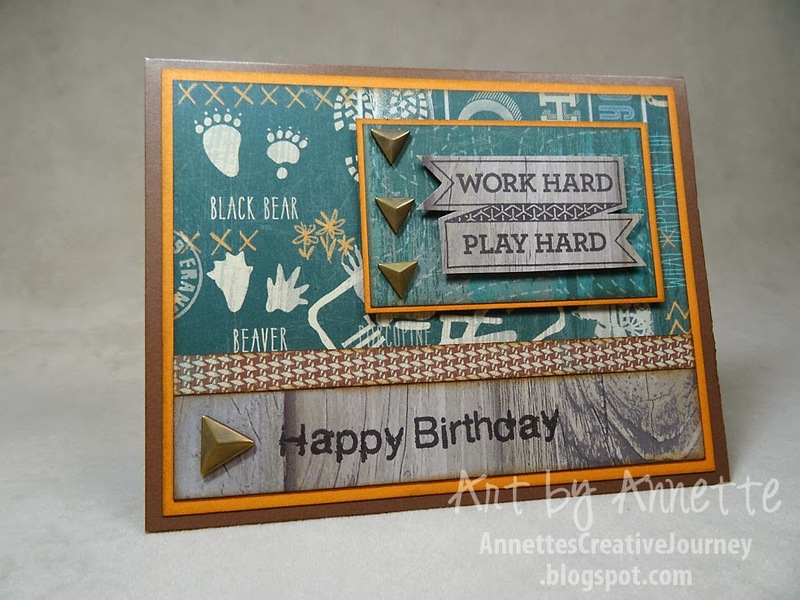 I've used "All the Details" stamp set and an older birthday set to stamp this card, and included the new Triangle Durables Studs. These little adhesive-backed triangles come in two sizes and in antiqued silver and gold. Really easy to just peel and stick. 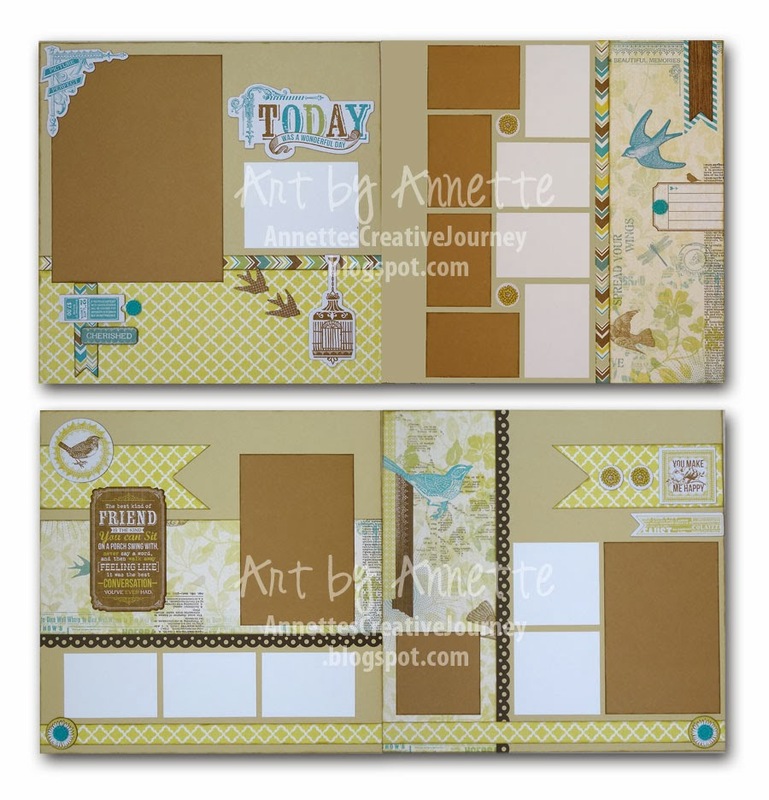 That's a pretty good summation of what's new in the way of Close To My Heart papers, stamps and embellishments, but there's LOTS more new stuff this season, so be sure to check my website where you can view the entire Idea Book online. Or contact your local CTMH Consultant for your own Spring/Summer Idea Book. To close, I should mention the fantastic promotion this month. "Embossing is Boss." 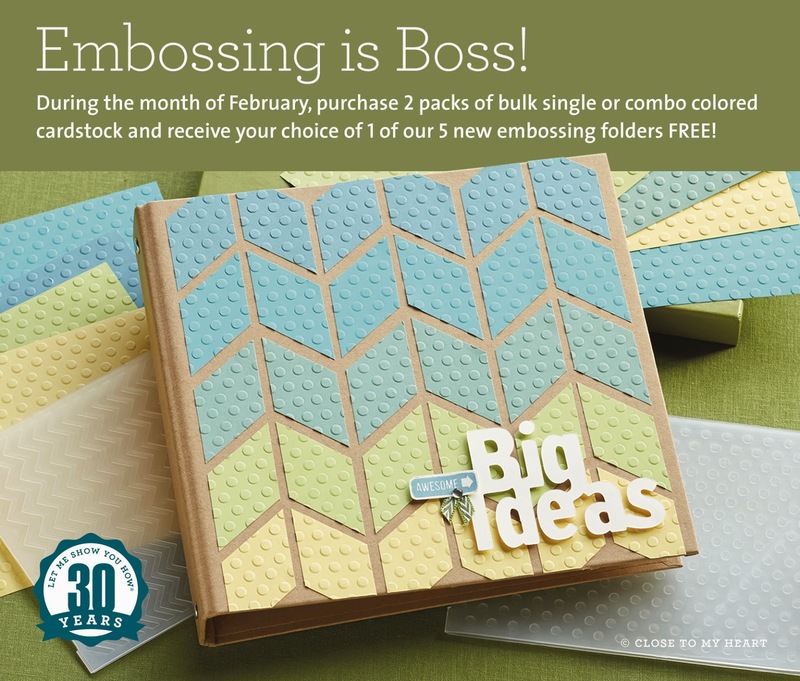 Simply purchase 2 packs of single or combo card stock from your CTMH consultant and you can choose one of the five new embossing folders for FREE. These new embossing folders are especially nice because of their generous 5 x 7 inch size. I don't know about you, but that's a big plus to me. I make 5 x 7 cards all the time and the small folders have always frustrated me. Here are the links to all the products I've mentioned above. Thanks for stopping in today. I hope you have a fabulously creative day! February Stamp of the Month "Wild About Love"
What a weekend it was! So very busy and extremely FUN. I'll have to be short today due to a couple hot projects I'm working on this morning, but I thought I'd share a quick recap. 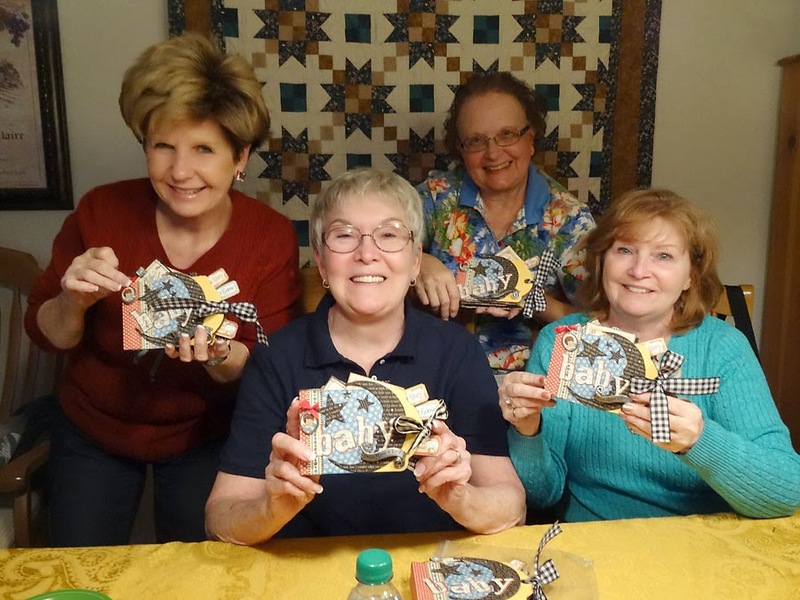 Friday was "Friday Follies" - my monthly group of ladies who come to learn how to create various projects. This month we made the four cards with Graphic 45's Typography papers which I featured on my blog last week at this post. We meet at 9 a.m. and everyone finished by 1:00 this time. (Sometimes we're at it all day!) Then it was back to work on some Graphic 45 projects I'm designing. 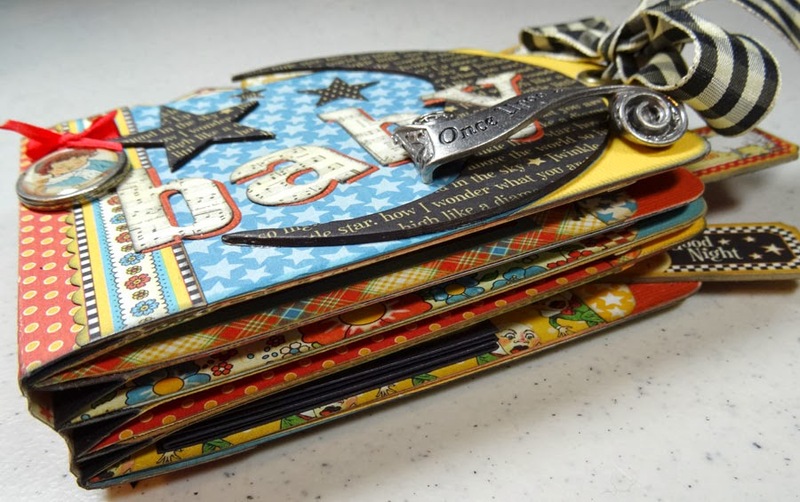 Saturday was a trip with my pal Sherry to St. Petersburg, FL to the wonderful Whim-so-doodle store for an art journaling class with Dina Wakley (new Signature Designer for Ranger). 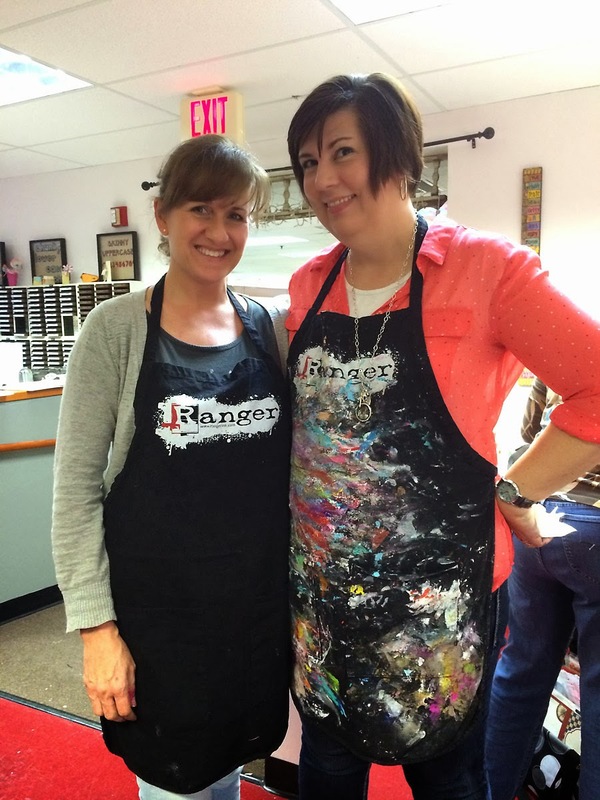 I had Sherry take this photo to show the difference in our Ranger aprons. Dina's, of course, shows how often she paints. 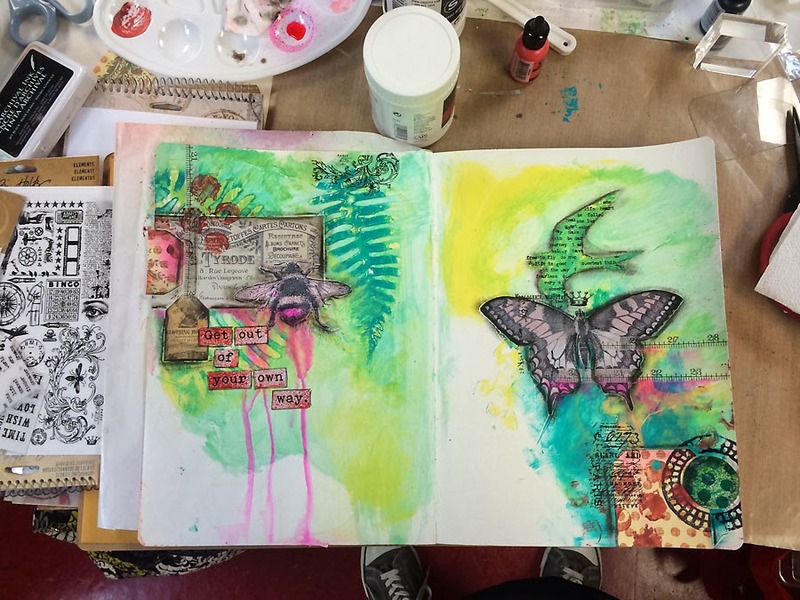 I don't pay to take classes very often, but Art Journaling is one of those things that intimidates me. The looseness, the unplanned, it just sends me into a tiny panic at first. Then when I let go and just start something, I am so completely involved and in love with the process. It's really quite freeing for a control-freak such as myself. I was delighted to learn many tips and tricks from Dina in composing my page. First rule: DON'T THINK, and that white space is a magical thing. These are my pages in progress above. Final touch: adding the words. 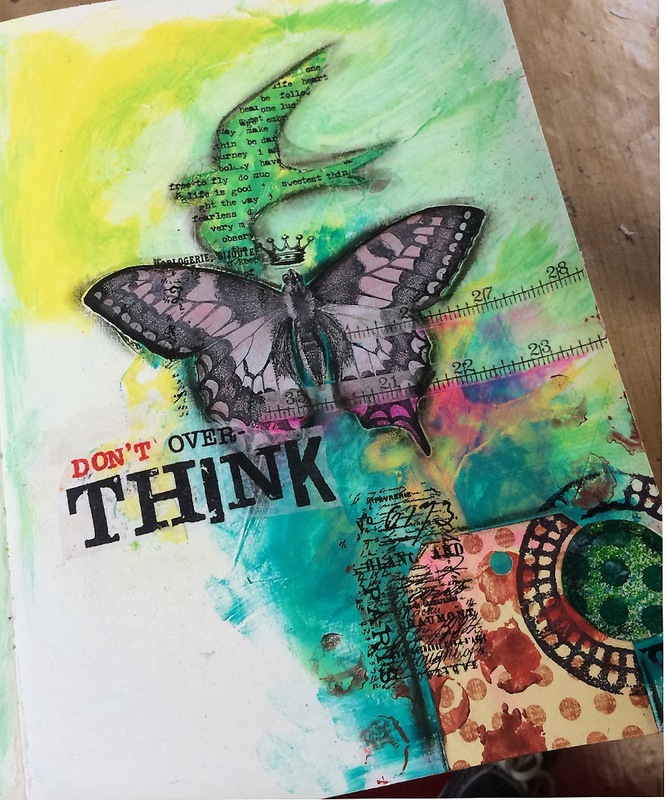 I stamped the phrase "Don't Over-Think" onto tissue paper with archival inks, then tore around it and collaged it onto the page. Genius! If I hadn't learned this simple trick, I would have tried to stamp right on the page and risked messing up. If you're planning to visit Florida and have the opportunity to go to the west coast (I live on the east coast) you've got to take the time to pop into Whim-so-doodle. You'll thank me later, trust me. It is the dream scrapbooking store, but I hate to call it that because it's SO much more. Mixed media takes up a large portion of the shop, and the classroom alone is beyond impressive. Sewing classes, mixed media workshops, you name it, they've covered it all. 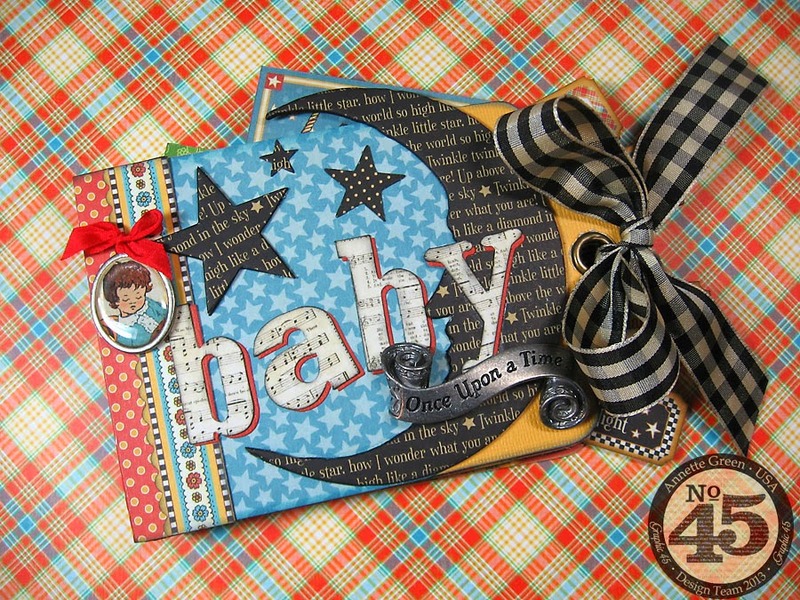 They have every single Tim Holtz/Ranger product you'd ever want, and carry top names in paper collections including of course the wonderful Graphic 45. 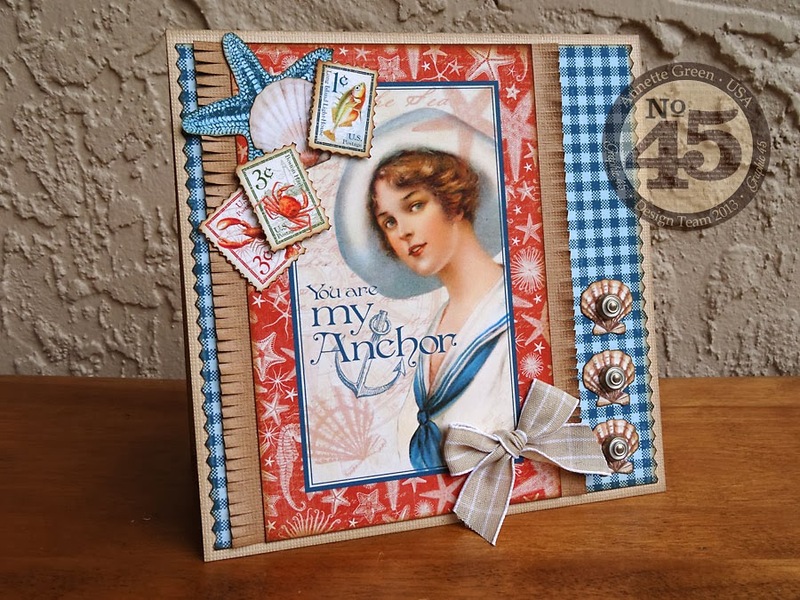 They have an excellent rapport with the big name designers who come to teach like Dina Wakley, Tim Holtz, Paula Cheney and Dyan Reaveley to name just a few; and the staff is delightful. Then it was on to Sunday and my Close To My Heart 2014 Spring/Summer Idea Book "Trunk Show." I thought it would be fun to do something a little different than my traditional open houses I've done in the past. Unfortunately, I took not a single photo of any of it! However, if you'll use your imagination and picture a setting much like a home gathering and me standing at the front of the room with vintage suitcases filled new product. As we walked through the Idea Book together, everyone comfortably seated with homemade cake pops, fresh fruit, wine and cheese before them, I passed around samples for each to touch and see up-close. Then everyone was invited to shop my clearance sale and do a make-n-take project, then place orders at their leisure. It was a big success and a fun afternoon for all. Tomorrow, I'll share samples from my Trunk Show that will help introduce you to all the new paper collections and lots of the new embellishments and other products in this season's Idea Book. 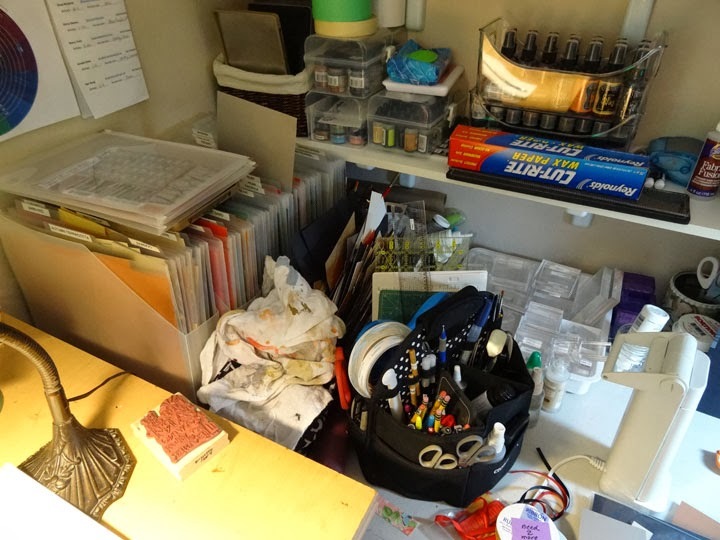 And I haven't forgotten about sharing my craft room organization part 2. Watch for that later this week. Thanks for stopping in and have a happy Monday! 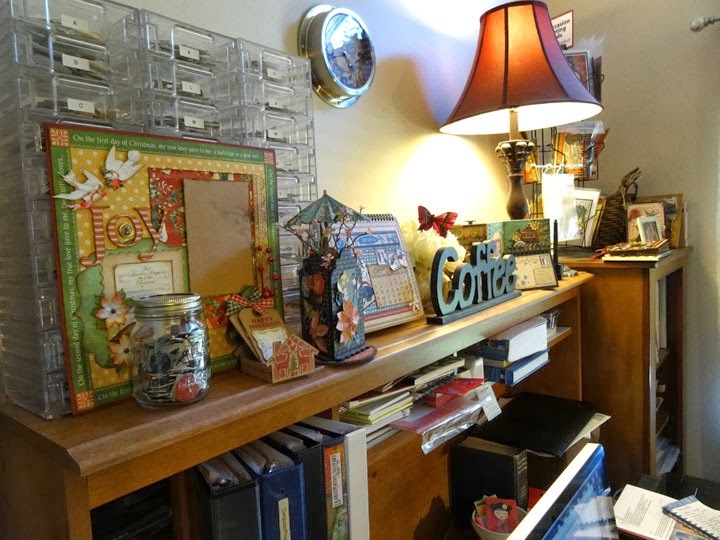 It's Super Bowl Sunday, and because of my craft room organization I am able to enjoy the Super Bowl while blogging. More on that in a minute. It's been a lot of work, no doubt, getting my room into shape. I've worked on it for a solid week. And honestly I'm still not completely done, but I've made great progress and I'm ready to share. Consider this post Part 1 of the process. Part 2 will include a video, so watch for that early next week. 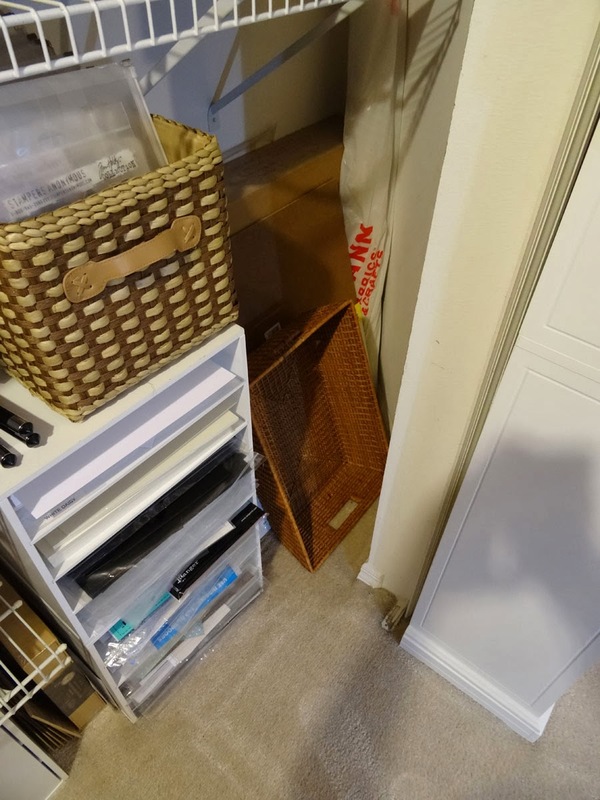 I've got a few hot projects to finish this week first, but I promise I'll be back with some organizing tips and tricks that work for me and will hopefully inspire you as well. 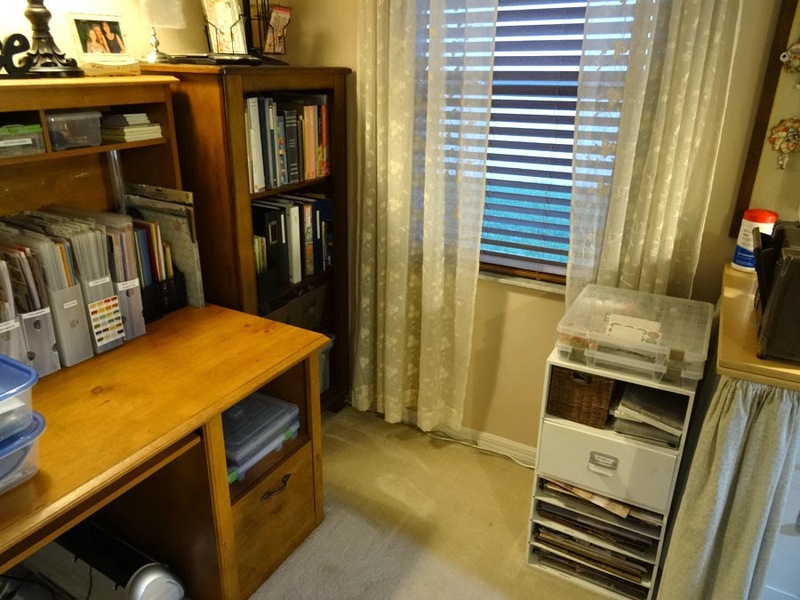 The family computer was also in my craft room, which included the scanner, printer, and various office supplies. All of this is now in the living room. I'll be sure to include that part in my video. I love having the computer in the living room where the family hangs out. I am able to work and still be with them. 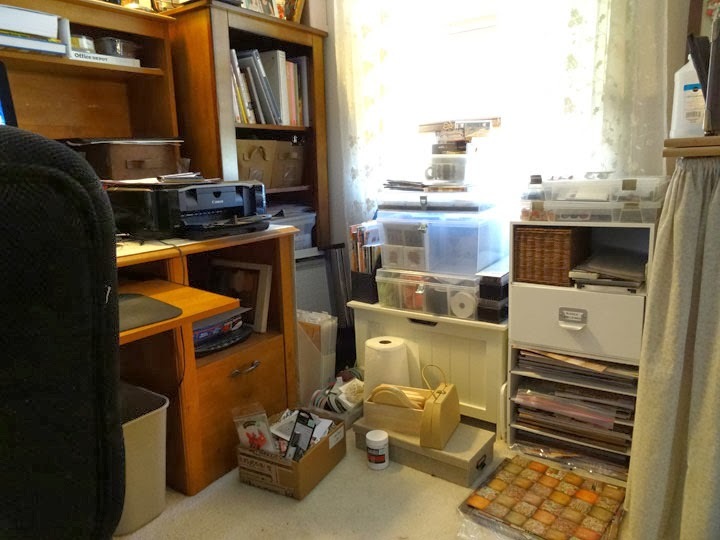 For the creative work, I head to the craft room where I have more peace and quiet. It was just too crowded in there before. This corner was so awful. I couldn't get to stuff on the bookshelf without having to move this and climb over that. The bench seat had to go. It was just in the way. 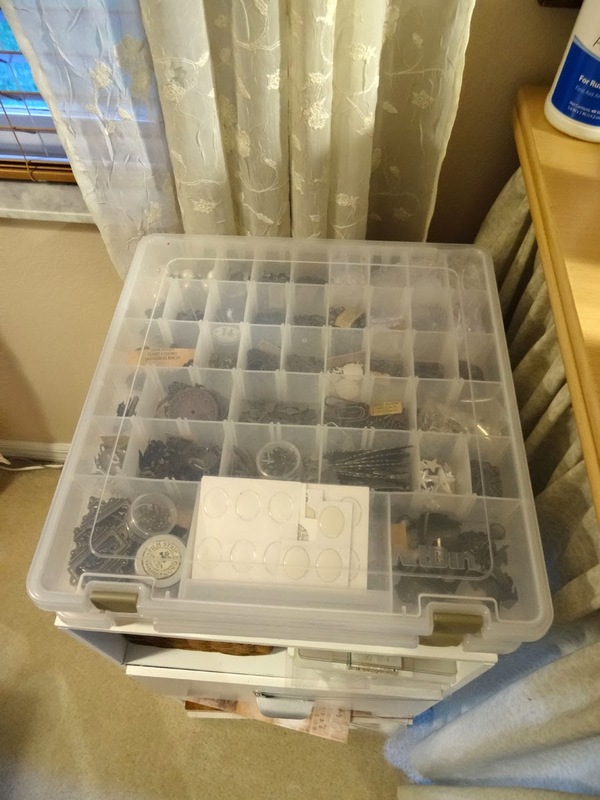 It serves as storage for things I don't need to get to very often, so I put it under my work table along the other wall. I love that I can now open my window without bending over stuff and wrenching my back. Piles off the floor. Everything is organized into labeled bins. 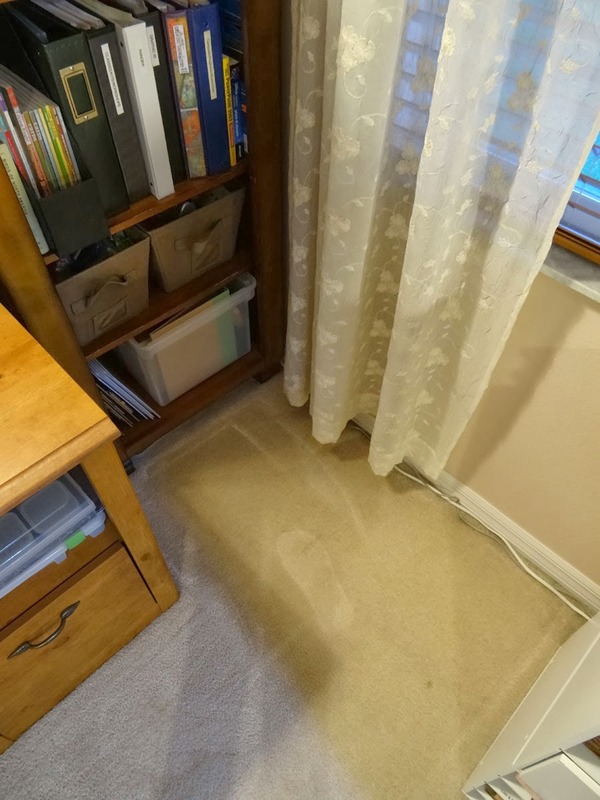 I couldn't even see the floor before. Some items went out to the garage, and others went into bins. I had been stuffing things behind the door of my room for so long, I forgot what was even back there. I found a frame I had been looking for! Now the door opens all the way. There's still stuff behind it, but less of it and much more neatly placed. 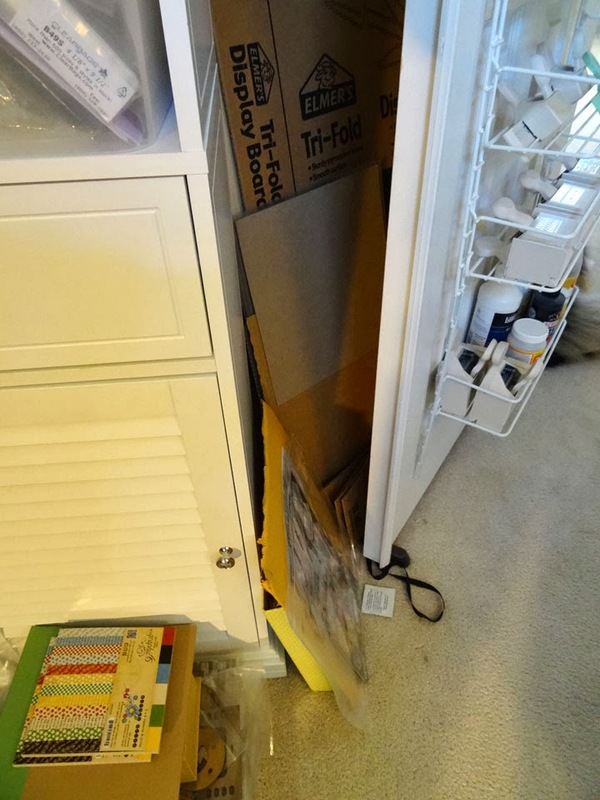 This odd space in my closet isn't easy to get to, so I make sure to store only the large things back there that I don't need to get to very often. 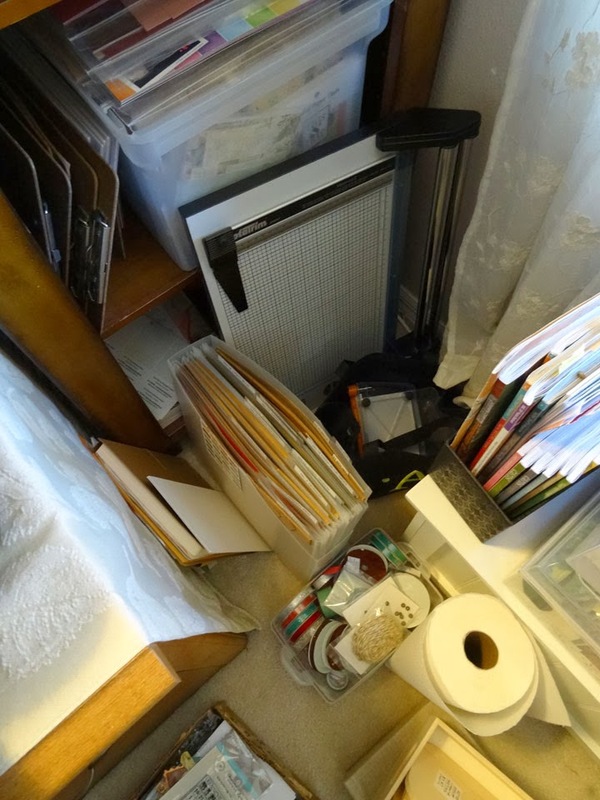 A large roll of fabric, large paper pads, mat board, and a big basket. The rest of it got reorganized into other places. There was no rhyme or reason to this shelf in my closet before, and I found that I really didn't need those plastic drawers anymore, so I went through some of my stamps from various other companies (besides Close To My Heart and Hampton Art which are stored in a different area) and now they are easy to find, see and reach. There was just too much clutter on the top of this desk hutch, and therefore a constant need for dusting. Now I've displayed some of the pieces on another shelf across the room and left some here. 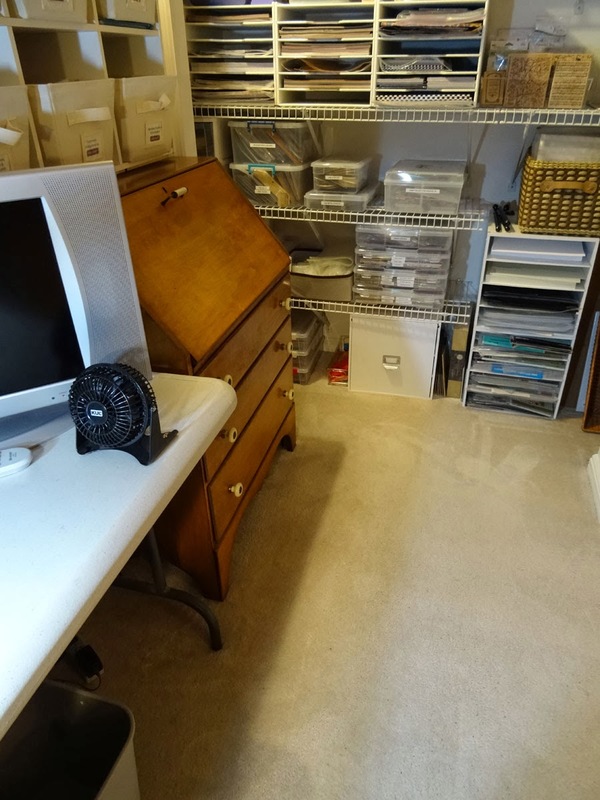 The cubbies below are now neatly organized and the computer is gone and replaced with vertical paper storage. Labeled of course. Oh my goodness. This feels so much better when I walk into the room. 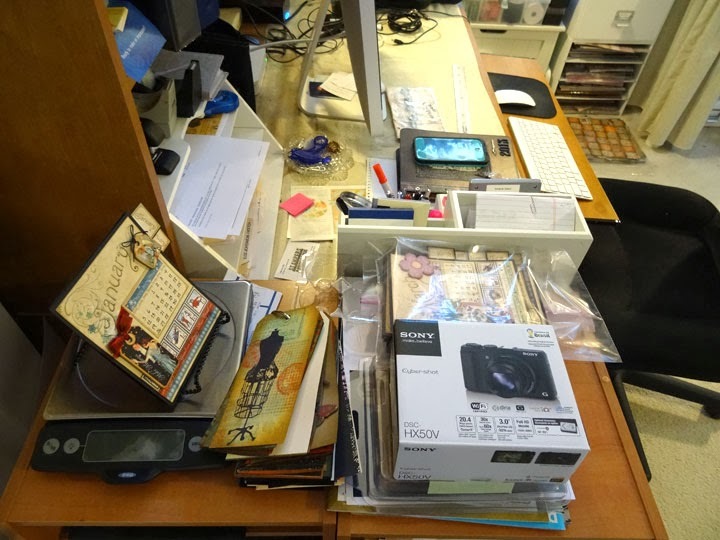 Now that I've gotten the computer and printer out of here, I have more table top space so I don't have to spread things all over the floor. 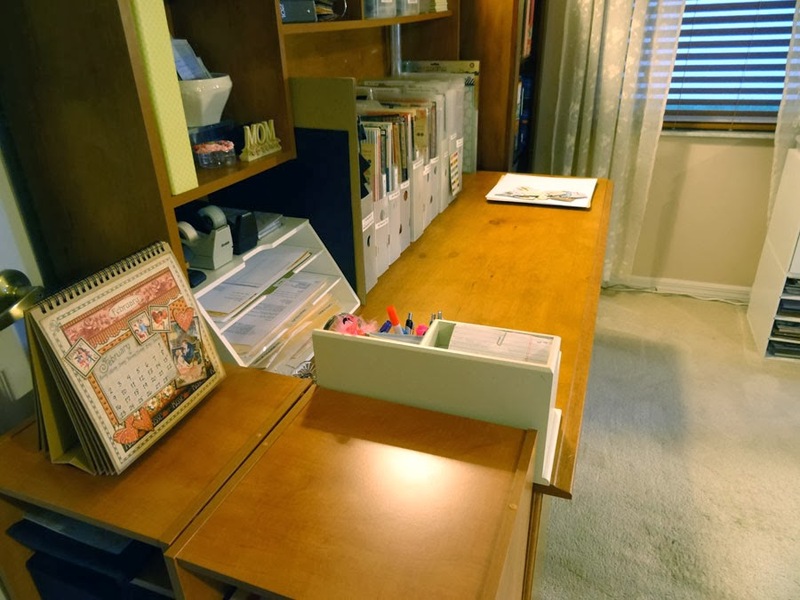 This will be my work-in-progress table where I can place project bins. I am constantly working on several projects at once, so this is going to help me tremendously. This is my tall work table where I stand to work. I like to stand more often than sit, so I am normally here most of the day. 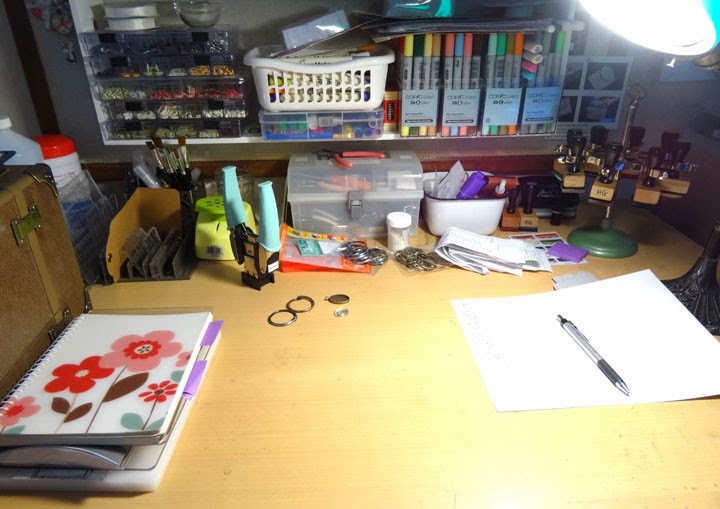 There's still a lot of stuff on this table, but these are tools and materials I use daily so this system works best for me. 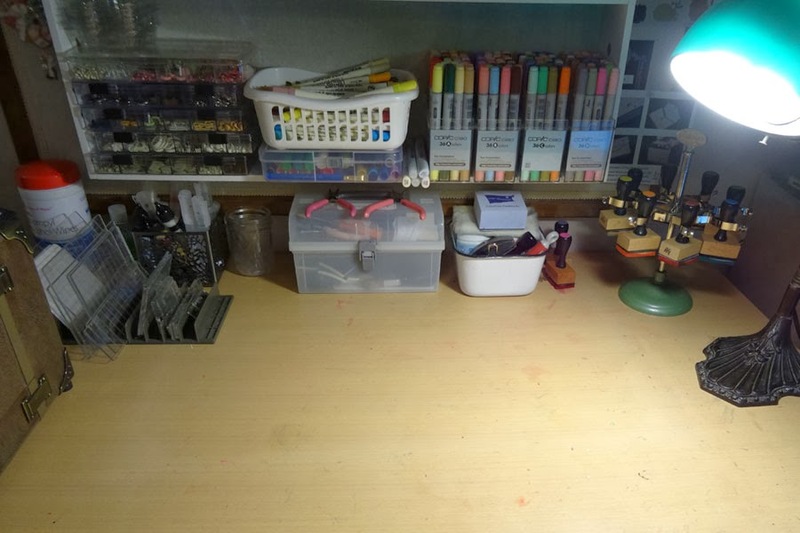 Still a lot in this corner, but much more organized and less cluttered. My poor tote is crammed full, but it's always that way and it works for me. Probably my favorite thing about my organization plan is that the extra table is now gone. 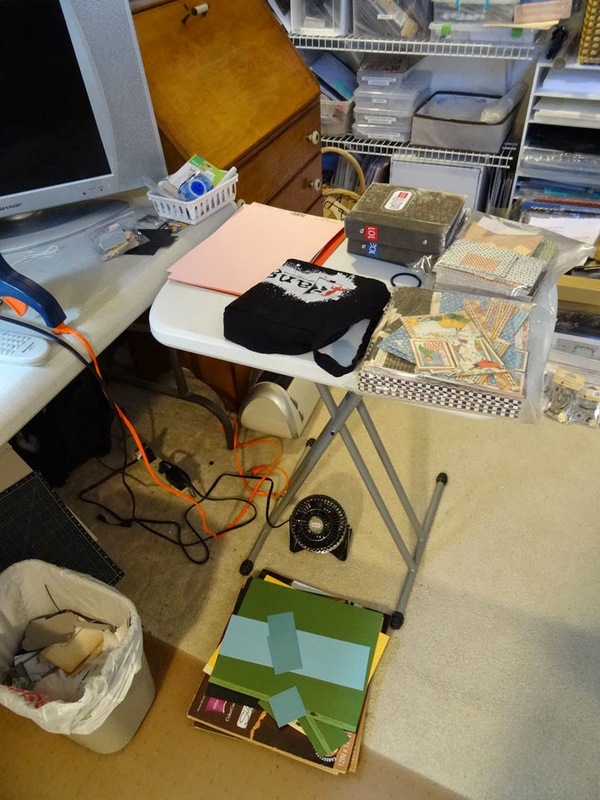 Normally I have my Cricut Expression on that little table, but when I got super busy I needed more table top space so I just put the Cricut on the floor and piled stuff on the table. It stuck out into the room and the room is just too small for that. The Cricut is now stored under my desk. Since I don't use it daily, I can easily pull it out and use it when I need to. 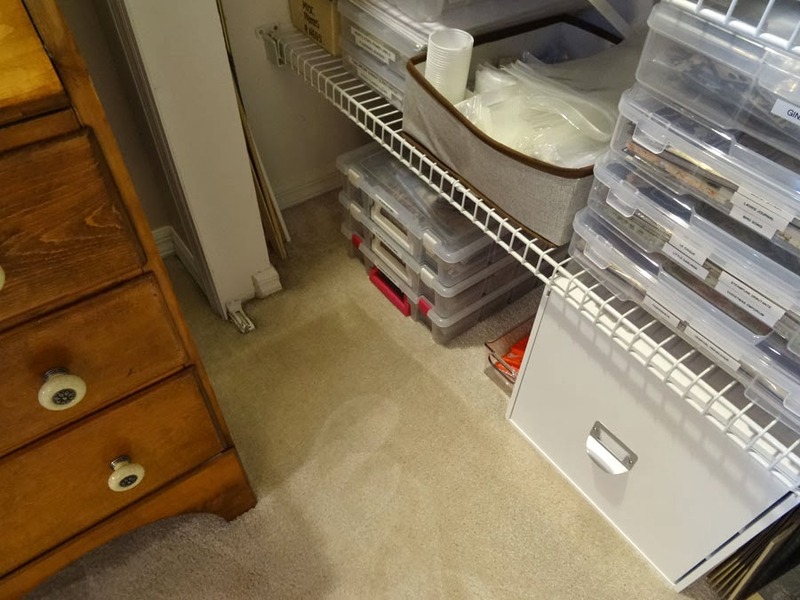 In my earlier post, I mentioned that I didn't want to spend a lot of money when organizing my space. In total, I spent about $115. No big furniture purchases, no major shelving. 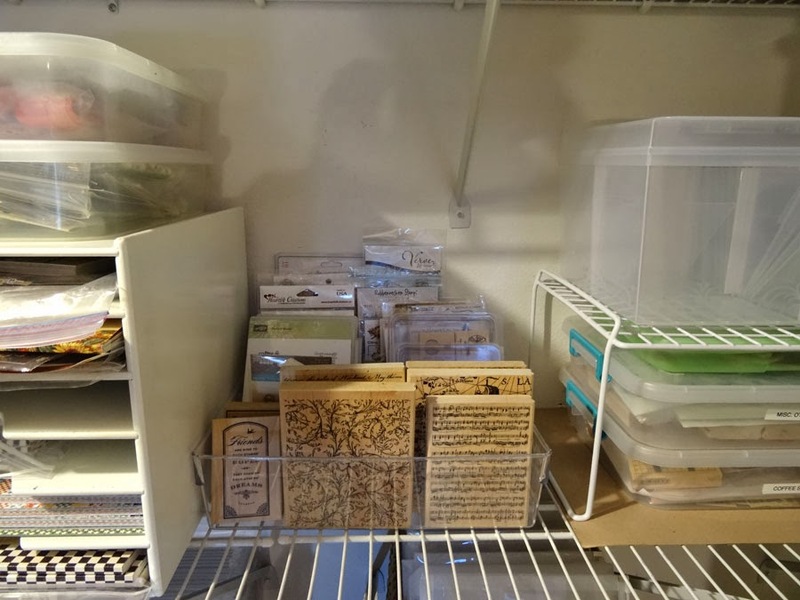 I simply purchased a bunch of Cropper Hopper vertical storage bins and several packs of their paper organizers (a good deal on Amazon), and a handful of 12 x 12 storage bins (on sale at Michaels last week). Everything else is stored in containers I already had. My room is the way I like it and how I like to work. I like things open. If it's out of sight, then it's truly out of mind for me. 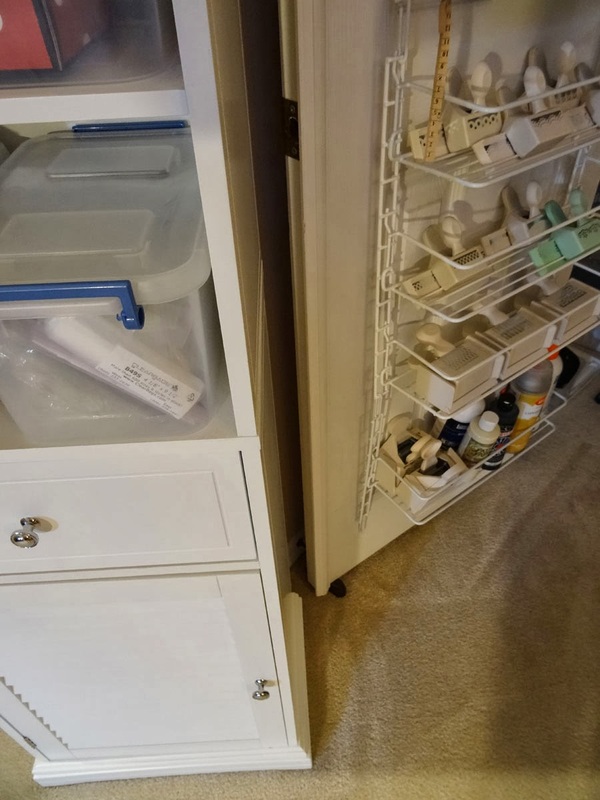 You'll notice I use clear bins as much as possible. This really helps me. My room is not spotless and super neat like those rooms you see in magazines. I really work here, every single day all day long, so it's got to be comfortable for me and my style of working. And I really love it! It takes a lot of time and effort, but it's so worth it in the end. The first day I started in one corner and set a timer for one hour. When the timer went off, I stopped. I was pretty overwhelmed at first, so this helped keep things in check. If you only have 15 minutes, then do it for 15 minutes. I knew that I had to finish by today because I set that goal for myself and for you, so after that first day I really dug in and spent more time each day getting it done. 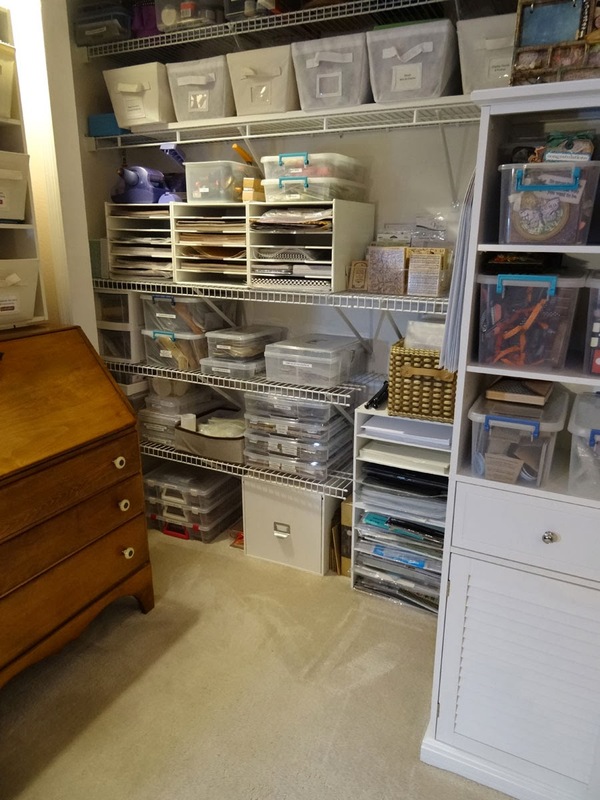 I hope this has inspired you to get organized too. I'll be taking a few days off from blogging this week, but promise to share a video next week with more organizing tips and tricks. Thanks for popping in and let me know if you're inspired to get organized.